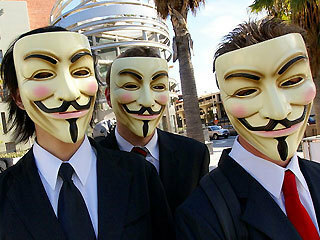 Anonymous hackers planning real-world attacks ! A computer security firm working to expose members of hacker group "Anonymous" pulled out of a premier industry conference here due to threats of real-world attacks on its employees. HBGary personnel have been peppered with threatening messages since Anonymous hackers looted data from its computer systems earlier this month, according to a message on the California firm's website Wednesday. "In addition to the data theft, HBGary individuals have received numerous threats of violence, including threats at our tradeshow booth," the company said. "In an effort to protect our employees, customers and the RSA Conference community, HBGary has decided to remove our booth and cancel all talks." Cyber security specialists and national security officials are in San Francisco this week to share insights on topics ranging from guarding "smart" power grids to blocking attacks on smartphones and computer tablets. Anonymous, the hacker group behind online attacks on companies that withdrew services to WikiLeaks, busted through HBGary Federal computer defenses early this month because the firm was working with federal agents to expose their identities. Anonymous took credit for breaking into the website of HBGary Federal, stealing tens of thousands of email messages and temporarily routing traffic to a page with a vitriolic message. The HBGary hack was more sophisticated than the distributed denial of service (DDoS) attacks last year on the Amazon, Visa and MasterCard websites in apparent retaliation for their decisions to stop working with WikiLeaks. WikiLeaks has triggered political ire in Washington for its publication of a trove of classified US diplomatic cables, as well as military reports from Iraq and Afghanistan. In a typical DDoS attack, a large number of computers are commanded to simultaneously visit a website, overwhelming its servers, slowing service or knocking it offline completely. Last month, British police arrested five people and the US Federal Bureau of Investigation launched raids across the United States as part of a probe into cyberattacks by Anonymous.